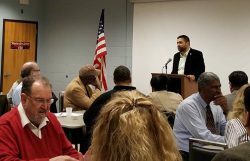 Union County Freeholder Chairman Sergio Granados addresses the CDBG Grant recipients at the Year 44 Workshop in Cranford on October 19. Union County, NJ – The Union County Board of Chosen Freeholders is pleased to announce that the disbursement process is under way for more than $4.6 million in funding to municipalities and organizations across Union County, under the Community Development Block Grant program. Now in its 44th year, CDBG is a federal program administered at the local level for the U.S. Department of Housing and Urban Development. The funds go to improving roadways, social service programs, and housing assistance with a focus on seniors and low income families. Each year, the Union County Department of Economic Development hosts a workshop to inform awardees on the disbursement process. The Year 44 workshop took place on October 19. “Community Development Block Grants fund initiatives and programs that contribute to the success and betterment of our community,” said Freeholder Chairman Sergio Granados, who met with and thanked over 60 service providers and township representatives at the workshop. The CDBG program includes the Home Improvement Program, through which residents are provided deferred payment loans to make improvements to upgrade their homes to standard conditions. The loans are non-interest bearing and payment is deferred until sale or transfer of the property. Union County administers CDBG grants for 19 of the 21 municipalities. The Home Improvement program is available to residents of 17 of the 21 municipalities.